We invite you to fill out our online inquiry form. You can also get to know Siena by exploring this website, viewing the online viewbook, and following us on Facebook and Twitter. The best way to understand Siena is to see it in action and interact with our students and faculty. 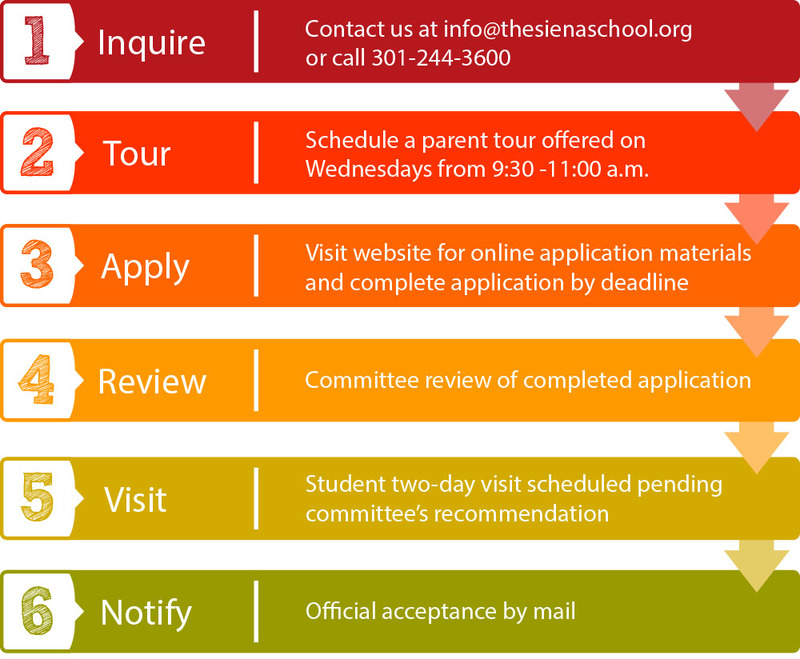 Parent/Guardians are encouraged to visit Siena for a tour of the facility. We offer small group tours each Wednesday at 9:30 am, and can arrange individual tours at other times if desired. Please click here to schedule a tour. Unable to make a Wednesday tour? Contact our Admissions Office. Siena's application is available online. Please click the link to reach the online forms. Download the application checklist as a helpful tool to complete the application. Achievement/academic assessment on the Woodcock-Johnson IV, Wechsler Individual Achievement Test (WIAT-III) or similar, including reading, math, and written language. Completed or updated within the last 12 months. Service Provider Release Form: Please present this completed form to any related service provider that may be working with your student, example - tutor, SLP, OT, psychologist. Release of School Records Form: Parent(s)/guardian(s) – Please sign and submit directly to student’s current school. It is the responsibility of the parent(s)/guardian(s) to ensure that the evaluations and records necessary to complete the admission process are sent to The Siena School by the application deadline of January 18th. If testing or other materials are pending, please contact the admissions office to notify them of the timeline. We can provide referrals for testing and evaluation professionals upon request. We can only review an application once all materials and forms have been submitted. We will begin reviewing individual applications as soon as all elements of the application package are received. After the review, the committee will make a decision regarding student visits. Not all applicants are invited to visit for two full school days. For best consideration, please submit application packages by January 18th. After this deadline, we will continue to review applications received, either for remaining spaces or for placement on the waiting list. It is best to contact the admissions office regarding available space after the deadline. After reviewing the completed application, we will contact you to schedule a student visit if we believe your child may be well served by our program. During this two-day visit, the applicant will participate with other students in a classroom setting during normal school hours. Students will also participate in three assessments during their visit: reading, writing and math. Additional information will be provided to the family when the visit is scheduled. In certain circumstances, we may request that the parents visit with Siena staff to discuss the child's application, testing and learning needs in more detail. We seek to provide notification of student visits, admissions and financial aid decisions on a timely basis once a completed application, including all supporting materials, has been received. The common notification date for acceptance is March 1st.